There are a slew of new Siri apps coming out in the jailbreak community. 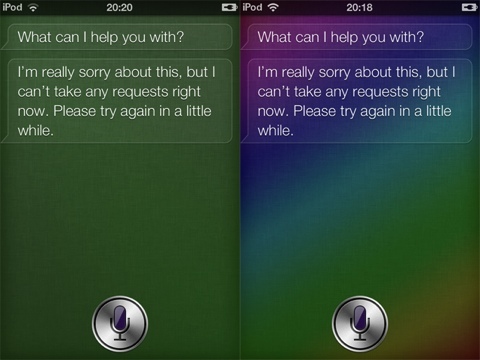 If you love talking to Siri, you’ll love these tweaks on your iPhone 4S. Here is a list of the best apps that add a ton of new functionality to the already powerful Siri feature on the iPhone 4S. Just to clarify, you need to have jailbroken your device and have Cydia installed to download and install these apps. To jailbreak your iPhone 4S you can use the latest release from GreenPois0n called Absinthe. You can find full step by step instructions on how to jailbreak your iPhone 4S using Absinthe here. As always be sure to back up your device before getting started and use mods at your own risk. AssistantExtensions is a powerful extension for Siri that serves as a plug-in architecture. 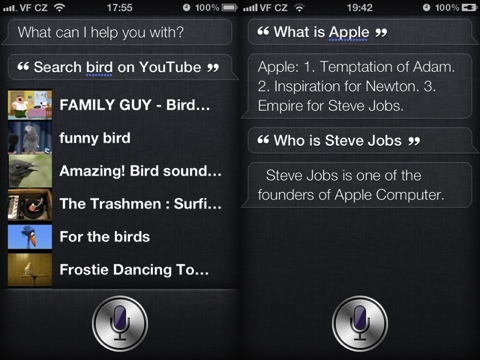 Developers can use AssistantExtensions and extend the functionality of Siri by building new Siri commands and features. By default, AssistantExtensions adds a few base commands. Use it to send tweets, launch apps, set brightness and more. You can even use it to tie into SBSettings for further voice command goodness. Finally there is a chat box built into AssistantExtensions so you can carry on a mini conversation with Siri. More information about AssistantExtensions and FAQ can be found at http://ae.k3a.me Download AssistantExtensions from Cydia. 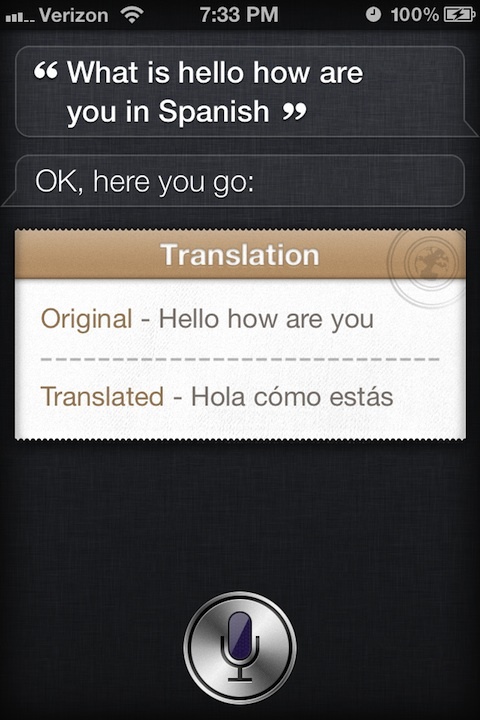 Lingual is a new Siri tweak from CodeThemed that adds translation functionality to Siri. You will need to have the AssistantExtensions app installed already. Lingual supports translation via Siri between the following languages Lingual Languages: Arabic, Czech, Danish, German, Estonian, Finnish, French, Dutch, Greek, Hebrew, Haitian, Hungarian, Indonesian, Italian, Japanese, Korean, Lithuanian, Latvian, Norwegian, polish, Portuguese, Romanian, Spanish, Russian, Slovak, Slovene, Swedish, Thai, Turkish, Ukranian, Vietnamese, and Simplified and Traditional Chinese. SiriToggles was the first of its kind in the tweaks for Siri apps. 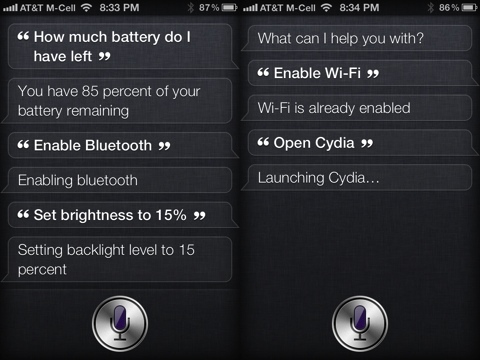 After installing this mod, you get some additional voice commands for Siri. With SiriToggles you can do things like turn on or off your WiFi and Bluetooth, and launch applications by name. For more details read the full review of SiriToggles. 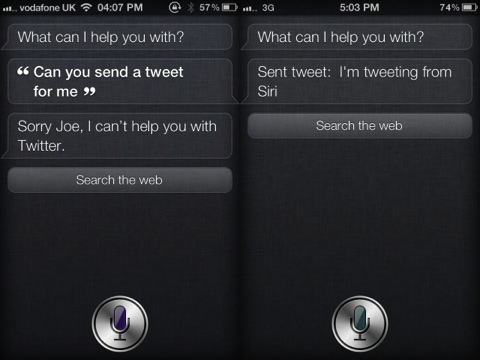 Sireet is a simple mod for Siri that add the ability to compose and send out Tweets with your voice. Twitter is already built into the iPhone 4S and iOS 5 but with Sireet you can now post Twitter messages with just your voice. There is no confirmation step, so be careful. Whatever you say is automatically posted to the Twitter account you have pre-configured on your iPhone. Just say “tweet” followed by any phrase you want to send out. This mod is actually a theme update for Siri that can swap the gray Siri Wallpaper to a set of other colors. You will need to be using Winterboard, and if not the install will do it for your automatically in Cydia. For more details read the full review of Siri Background Colors. AppSafari review of Best Siri Tweaks & Jailbreak Apps for the iPhone 4S was written by Joe Seifi on January 26th, 2012 and categorized under App List, Cydia Apps. Page viewed 10619 times, 3 so far today. Need help on using these apps? Please read the Help Page. I don’t know how to install cydiahome very bast app. I don’t know how install Cydiahome very bast app.